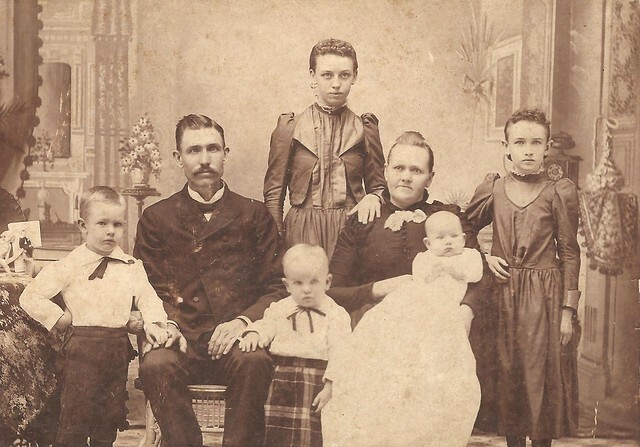 victorian family | Flickr - Photo Sharing! This family has the most beautiful eyes, particularly the younger daughter in the corner (It's easier to see at a larger size) and I absolutely adore the two (older?) boys' little outfits. The ties and the little boy's plaid skirt are so adorable. The picture is exceptionally clear too (with the exception of the little boy, who must have moved a little while the picture was being taken), though, again, it's better seen at a larger size. No names or date, unfortunately, but I'd place it in the 1890's. Maybe late 1880's. k.dmitrijewa, fotobarat6, stenaake, and 10 other people added this photo to their favorites. "CAPTURANDO EL PASO DEL TIEMPO"
I noticed a cabinet card photo on the table behind the shoulder of the boy. I wonder if that is a picture of a deceased child? or just a prop? It would explain the age spread with the young girl and the boy next to his father. They look to be about four or more years apart in age, where all the rest are about two or so years apart, which was quite common in the victorian era. Just a thought.